BEIJING. Sen. Manny Pacquiao brought a taste of Las Vegas to this Chinese capital as he put on a glittering event of nine fights, highlighted by the pro debut of Rio Olympian Lu Bin, with bright lights, dancing showgirls, upbeat music and exciting action before a by-invitation-only audience of 500 guests at the Hejuan Royal Garden Hotel grounds here Friday night. Pacquiao flew in from Manila the day before, presided in a press conference, participated in a consultative forum with Chinese officials in government, sports and business, obliged star-struck local fans seeking autographs and photographs and was at ringside with wife Jinkee for the 78-round card that was assembled in coordination with Las Vegas matchmaker Sean Gibbons. The card featured six Filipino fighters who swept their assignments but the scene stealer was clearly Lu Bin who stopped Thailand’s Wanchai Nianghansa at 2:41 of the third round to claim the vacant WBC Asia Boxing Council lightflyweight crown in the main event. Lu, 22, decked Wanchai once in the second and finished him off with a shot to the solar plexus as Filipino referee Danrex Tapdasan didn’t bother to count. Wanchai lay flat on his back gasping for over a minute before struggling to stand up. Pacquiao said the card marked the beginning of a long relationship with Dancing Sports Industry of Beijing and the Professional Boxing Commission of China to promote the sport not only in the Mainland but also in different parts of the world. Another boxing show is in the works for December. Dancing Sports chairman Vincent Zhou said the global infrastructure construction company Belt and Road will support four to five major cards a year in a multi-sports program to serve as a platform for international friendship. Pacquiao promised a night of fireworks and didn’t disappoint. Lu’s rousing win was a fitting climax. In the chief aperitif, Davao del Norte’s Mark Anthony Barriga pounded out a unanimous 10-round decision over grizzled Thai warrior Wittawas Basapean to capture the vacant WBO International minimumweight belt. The Thai exceeded the 105-pound limit by two pounds at the weigh-in and the title would’ve remained vacant if he won. Barriga, 24, didn’t drop a round as judges Edward Ligas, Martino Redona and Surat Soikrachang scored it 100-90. It was a virtuoso performance by Barriga who proved too quick and slick for Wittawas. Barriga, a southpaw. controlled the fight with his right jab and Wittawas hardly laid a glove on him as he displayed a near impregnable defense. The only drawback was Barriga’s lack of power. He never hurt Wittawas despite scoring virtually at will throughout the bout. Working his corner were trainer Joven Jimenez and IBF superflyweight king Jerwin Ancajas who partnered 50-50 in buying out Barriga’s contract from Jason Soong for P300,000. The win raised Barriga’s record to 7-0, with 1 KO. Power is something Barriga will work on in the gym as he scales the world ladder to become a serious title contender. In other fights, China’s Jin Xiang Pan trounced Australia’s James MacDonald via a unanimous 10-round decision for the vacant WBO Asia Pacific Youth superfeatherweight title, Cotabato del Norte’s Ronnie Maldonado disposed of Indonesia’s Iwan Zoda with a body shot at 0:49 of the sixth round to win the interim WBO Oriental flyweight crown, Davao City’s Jay-R Inson survived a nasty cut in the corner of his left eye to eke out a majority eight-round verdict over Yang Cheng Jin in a close lightwelterweight encounter, Zamboanga del Norte’s Rene Mark Cuarto flattened Guang Xiong Li for the full count with a body shot at 0:55 of the third round in a lightflyweight contest, General Santos City’s Vincent Astrolabio dominated Ayati Sailike in an eight-round superflyweight shutout, Agusan del Sur’s Genesis Libranza defeated Yu Jie Zeng by a unanimous eight-round decision in a flyweight bout and Ya Hong Yi beat late substitute Gao Lio by a unanimous six-round verdict in a women’s superflyweight tussle. Boxing trainer Nonoy Neri, who runs a gym and manages a stable for Pacquiao in Davao City, brought five of his discoveries to Beijing. Only Barriga who saw action Friday night wasn’t with Neri. He singled out Maldonado and Cuarto for their discipline in sticking to the fight plan without going for a slam-bang knockout. Both fighters went to the body in stopping their opponents, steering away from the more conventional approach of scoring a knockout with a head blow. Neri said Inson’s win wasn’t as convincing as the others because he took a step down in weight class from welterweight to lightwelterweight. Jin, a showman who tried to distract Inson by waving his arms like a shaolin dancer, pushed Inson to the limit but couldn’t connect consistently. Judge Mark Leong saw it 57-all but judge Ligas had it 58-56 and judge Tapdasan, 59-55, both for Inson. Neri credited his five fighters for their hard work and sacrifice in preparing for China because they didn’t want to let Pacquiao down. 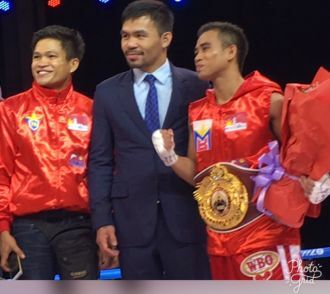 Photo: Sen. Manny Pacquiao with IBF superflyweight champ Jerwin Ancajas (left) and newly-crowned WBO International minimumweight titlist Mark Anthony Barriga in Beijing.